In 1968, Georgia Davis Powers became the first African American and the first woman ever elected to the Kentucky State Senate. Even before she began her career as a senator, Georgia Powers was a great leader in the Civil Rights Movement in Kentucky. Senator Powers’ public service career often focused on the unique needs of women, but her preparation for being an outspoken pioneer in matters of gender started much earlier. She was born in Springfield in Washington County, growing up as the only girl in a family of nine children. Within the pages of her autobiography, I Shared the Dream, Senator Powers also revealed the way in which violence marked the years of her life. She is a survivor of violence, she is an instigator of change, and she is an inspiration to all future generations of girls and women. In honor of Senator Powers and her work on behalf of women, the Georgia Davis Powers Endowment was established. The Endowment symbolizes the truth that violence against women is pervasive in the United States and around the globe, crossing boundaries of race, ethnicity, class, caste and age—crossing lines of country, region, state and nation. 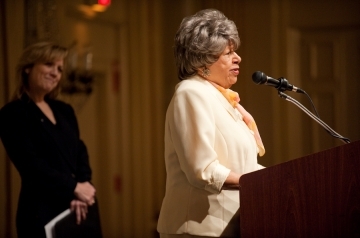 The Georgia Davis Powers Endowment affirms the importance of addressing race, ethnicity, and other socio-cultural factors in the study of violence against women. The Endowment supports important research mission and the work of graduate and professional students who, inspired by Senator Powers' life and story, study in the violence against women field.